Test Drive iOS 7 Beta For iPhone 5 In Your Web Browser Right Now! By now, you will have heard quite a lot of opinions on iOS 7 beta. It has been covered ad nauseam in the blogosphere, and although some have been more impressed with the latest version of Apple’s mobile OS than others, it has been quite hard to avoid. Naturally, with so much conflicting press, you may be apprehensive about installing it on your iPhone or iPod touch, but luckily Recombu has an interactive demo for interested parties. The consensus of iOS 7 beta 1 indicates that it is a rather buggy affair. Of course, this is to be expected of an inaugural beta release, but that’s not to say everybody wishes to put up with it. If you’ve been off-put by the lack of stability from iOS 7 beta 1, particularly given how iOS is renowned in general as a reliable, seamless experience, then the demo will allow you to take a close-up look of the forthcoming software without the commitment. 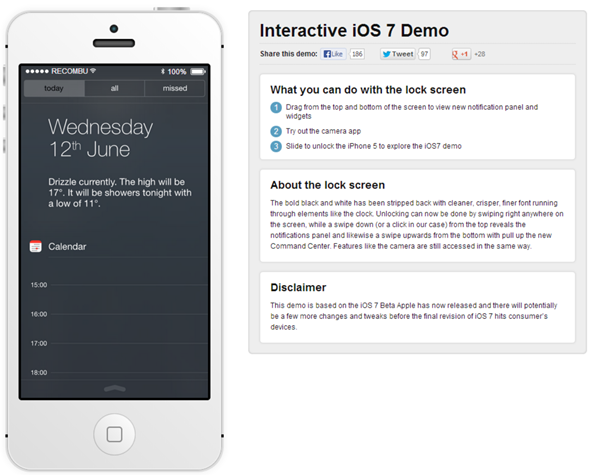 The Recombu demo gives a vicarious look into what it is like to use iOS 7 beta from day to day. It’s far from a perfect representation, but if you don’t wish to go ahead and install anything on your iOS device, it’s certainly the next best thing. You get your transitions, which some have argued slow iOS 7 down unnecessarily, as well as a couple of other new features. If you happen to be rocking Firefox or Chrome, you can use your webcam to take pictures from right within the Camera app, giving you a very firsthand idea of what it would be like to take a snap within iOS 7 beta. Two of the highlights of iOS 7 would have to be the revamped Notification Center and the all-new Control Center, which includes those eagerly awaited toggles jailbreakers will recognize from SBSettings. It’s certainly hard to make any judgments on iOS 7 based upon this beta, and although the knee-jerk reactions have been aplenty, I would advise anybody majorly disappointed by what they’ve seen to consider the fact that there’ll be quite a few changes in store before the GM release later on this year. So, check the interactive demo out by pointing your browser to: recombu.com/mobile/interactive/ios7-demo/ and be sure to share your thoughts with us by dropping a comment via the usual mediums below!